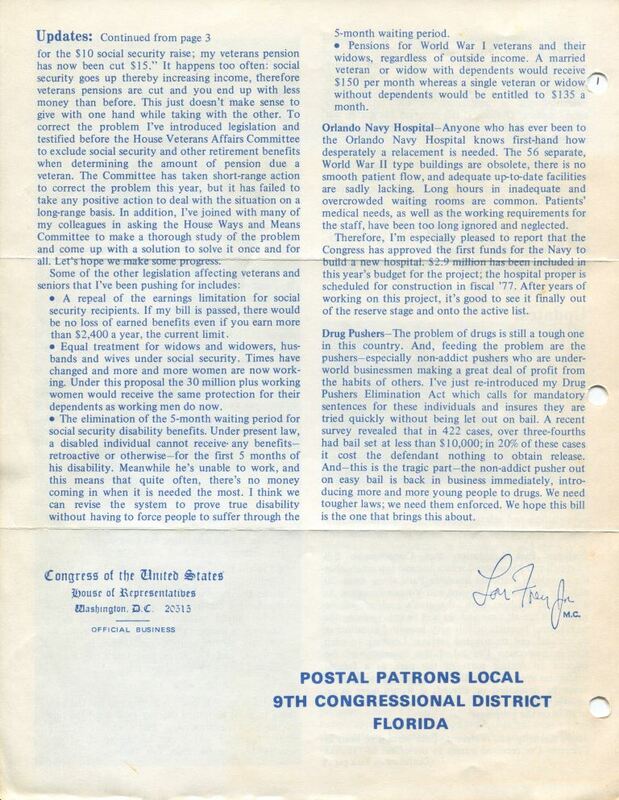 One page from the Florida From the House...To Your Home newsletter mailed to citizens of the 9th Congressional District of Florida, represented by Representative Louis Frey, Jr. (1934-), who served in the U.S. House of Representatives from 1969 to 1979. He was on several committees during his time in office, including the Select Committee on Narcotics Abuse and Control and the Science and Technology Committee. He was also the chairman of the Young Republicans of Florida. The first article cites updates related to legislation on veteran's affairs. According to the article, Rep. Frey introduced legislation and testified before the House Veterans' Affairs Committee to "exclude [S]ocial [S]ecurity and other retirement benefits when determining the amount of pension due [to] a veteran." Other legislation that Rep. Frey supported included a repeal of the earnings limitation for Social Security recipients, equal treatment for widows and widowers under Social Security, the elimination of the five-month waiting period for the receipt of Social Security Disability Insurance (SSDI) benefits, and pensions for World War I veterans and their widows. The second article discusses renovations need for the Orlando Navy Hospital. Rep. Frey reports that Congress had approved funding for the construction of a new hospital in Central Florida. Some of the Veterans' Administration (VA) medical facilities in Central Florida were old and outdated by the 1970s. Rep. Frey and others wanted to replace them with more modern facilities in order to better serve the district's veteran population. The initial goal was to obtain a VA hospital for Brevard County, and Rep. Frey introduced legislation that would have this result. Although the legislation did not pass through Congress, the spotlight on the issue of veterans' medical care helped to encourage other advances. One example of this was Congress' funding of a new Navy hospital in Orlando, which was a much-needed replacement for the old facility. The third article focuses on the illegal narcotics trade in the United States. According to the article, Frey reintroduced the Drug Pushers Elimination Act, which called for mandatory sentences for drug dealers and insured that "they are tried quickly without being let out of bail." 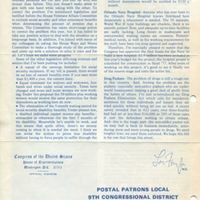 Original newsletter by Lou Frey, Jr., December 1975: Lou Frey Papers, box 11, Lou Frey Institute of Politics & Government, Special Collections and University Archives, University of Central Florida, Orlando, Florida. Digital reproduction of original newsletter by Lou Frey, Jr., December 1975. Lou Frey Papers, box 11, Lou Frey Institute of Politics & Government, Special Collections and University Archives, University of Central Florida, Orlando, Florida. Lou Frey Institute of Politics & Government Collection, RICHES of Central Florida. Originally created by Lou Frey, Jr. Copyright to this resource is held by the Lou Frey Institute of Politics & Government and is provided here by RICHES of Central Florida for educational purposes only. "Congressman Lou Frey, Jr. Biography." Lou Frey Institute of Politics & Government. http://loufreyjr.com/. "FREY, Louis, Jr., (1934 - )." Biographical Directory of the United States Congress, United States Congress. http://bioguide.congress.gov/scripts/biodisplay.pl?index=F000381. Frey, Lou, and Aubrey Jewett. Political Rules of the Road: Representatives, Senators, and Presidents Share Their Rules for Success in Congress, Politics, and Life. Lanham, MD: University Press of America, 2009. Frey, Lou, and Michael T. Hayes. Inside the House: Former Members Reveal How Congress Really Works. Lanham, MD: U.S. Association of Former Members of Congress, 2001. Valentine, Douglas. The Strength of the Wolf: The Secret History of America's War on Drugs. London: Verso, 2004.
for the $10 social security raise; my veterans pension has now been cut $15.” It happens too often: social security goes up thereby increasing income, therefore veterans pensions are cut and you end up with less money than before. This just doesn’t make sense to give with one hand while taking with the other. To correct the problem I’ve introduced legislation and testified before the House Veterans Affairs Committee to exclude social security and other retirement benefits when determining the amount of pension due a veteran. The Committee has taken short-range action to correct the problem this year, but it has failed to take any positive action to deal with the situation on a long-range basis. In addition, I’ve joined with many of my colleagues in asking the House Ways and Means Committee to make a thorough study of the problem and come up with a solution to solve it once and for all. Let’s hope we make some progress. A repeal of the earnings limitation for social security recipients. If my bill is passed, there would be no loss of earned benefits even if you earn more than $2,400 a year, the current limit. Equal treatment for widows and widowers, husbands and wives under social security. Times have changed and more and more women are now working. Under this proposal the 30 million plus working women would receive the same protection for their dependents as working men do now. The elimination of the 5-month waiting period for social security disability benefits. Under present law, a disabled individual cannot receive any benefits--retroactive or otherwise--for the first 5 months of his disability. Meanwhile he is unable to work, and this means that quite often, there’s no money coming in when it is needed the most. I think we can revise the system to prove true disability without having to force people to suffer through the 5-month waiting period. Pensions for World War I veterans and their widows, regardless of outside income. A married veteran or widow with dependents would receive $150 per month whereas a single veteran or widow without dependents would be entitled to $135 a month. Orlando Navy Hospital--Anyone who has ever been to the Orlando Navy Hospital knows first-hand how desperately a replacement is needed. The 56 separate, World War II type buildings are obsolete, there is no smooth patient flow, and adequate up-to-date facilities are sadly lacking. Long hours in inadequate and overcrowded waiting rooms are common. Patients’ medical needs, as well as the working requirements for the staff, have been too long ignored and neglected. Therefore, I’m especially pleased to report that the Congress has approved the first funds for the Navy to build a new hospital. $2.9 million has been included in this year’s budget for the project; the hospital proper is scheduled for construction in fiscal ‘77. After years of working on this project, it’s good to see it finally out of the reserve stage and onto the active list. Drug Pushers--The problem of drugs is still a tough one in this country. And, feeding the problem are the pushers--especially non-addict pushers who are underworld businessmen making a great deal of profit from the habits of others. I’ve just re-introduced my Drug Pushers Elimination Act which calls for these individuals and insurers they are tried quickly without being let out on bail. A recent survey revealed that in 422 cases, over three-fourths had bail set at less than $10,000; in 20% of these cases it cost the defendant nothing to obtain release. And--this is the tragic part--the non-addict pusher out on easy bail is back in business immediately, introducing more and more young people to drugs. We need tougher laws; we need them enforced. We hope this bill is the one that brings this about. Lou Frey Jr. M. C.
Frey, Lou, Jr. . “Florida From the House...To Your Home Newsletter, December 1975.” RICHES of Central Florida accessed April 22, 2019, https://richesmi.cah.ucf.edu/omeka/items/show/3613.